This is a family recipe passed to me by my Grandmother (Nonna) before she passed away in '92. My Grandmother's side of the family are from Scilla, Reggio Calabria, Italy. Scilla is a Calabrian village on the 'big-toe' of Italy just across from the Sicilian city of Messina. What I had discovered when visiting Scilla was that the food is HEAVILY influenced by Sicilia (with a lil'Calabrese thrown in); this gave me a greater understanding on how my Grandmother cooked. . :-) She also blended a style of cooking of Naples, which was a tribute to my Grandfather's family with roots there. 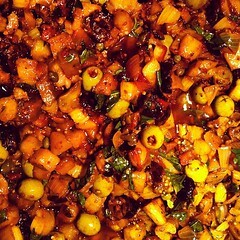 Caponatina is a variant of Caponata, a Sicilian eggplant/olive antipasti. My family and I lovingly call it ''Gobble-da-dina." Whenever I prepare it, memories are conjured up of my Grandmother and my childhood in Canarsie (a small town in Brooklyn, New York). If you we're to ask what was our family's signature dish, I would stand proud and say "Gobble-da-dina!' I was privileged to have been taught this recipe by my Grandmother herself and now I share this recipe with love and respect. In a large skillet, bring olive oil up to temperature. Cook eggplant until lightly brown, remove. Add oil only when necessary, eggplant will soak it up. Set the eggplant aside in a bowl. * hint, when cutting the eggplant place in a large bowl of cold salted-water. This keeps the eggplant from getting brown (oxidation) and helps prevent too much oil from being soaked in during cooking. Rinse and drain prior to frying. The pine puts can be roasted in the oven... place pine nuts on a small baking tray and bake until golden brown (keep an eye on the process and constantly mix the nuts up to help evenly roast and prevent over roasting. 1. Fry the eggplant with olive oil in a large skillet and set aside. Cook thoroughly but not too soft! Don't over use the olive oil, eggplant has a tendency to soak up the oil, but will release some as it approaches being done. 2. In a deep-dish large skillet or large sauce pan, cook the onions and celery in olive oil. Stir constantly and when the onions are just beginning to show some translucence reduce heat to medium. Now's the time add the olives and capers followed by the eggplant, mix well and let simmer for about 5-minutes. Add tomatoes, balsamic vinegar; heat until just bubbling then add the chopped basil, sugar, salt and pepper. Simmer for 5-10 minutes mixing fairly often. Let cool until room temperature, stirring occasionally while adding the optional pine nuts. Store in refrigerator.